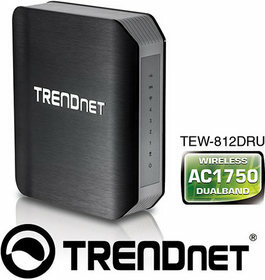 TORRANCE, CA--(Marketwire - Feb 26, 2013) - TRENDnet, a best-in-class wired and wireless networking hardware brand, today announces the availability of the AC1750 Dual Band Wireless Router, model TEW-812DRU. "We are confident in this router's performance," stated Sonny Su, technology director for TRENDnet. "We have taken the time to fine tune performance, feature sets, and usability. We look forward to reviewer and consumer feedback." The TEW-812DRU is designed to easily handle multiple HD streams in a busy connected home. Multiple User MIMO technology enables the router to communicate with multiple devices simultaneously -- producing a significant performance boost in real world environments. Plug in a USB flash or network attached storage drive to share HD videos and music across the network. Gigabit ports on the back of the router maintain high speed wired connections. Create a secure isolated guest network for guest internet access. Beamforming technology directs the strongest signal to each connected device. Wi-Fi Protected Setup (WPS) connects other WPS supported wireless adapters at the touch of a button. Manage access to websites and file types with advanced access controls.